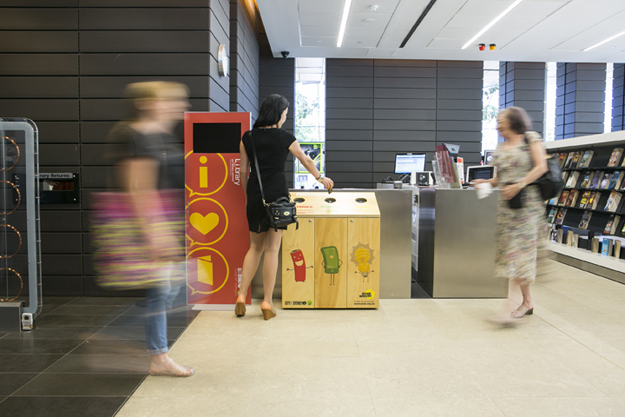 The City of Sydney has established ten recycling stations at community centres and libraries to enable residents to drop off their handheld batteries, light bulbs and mobile phones. This will mean that residents have access to a free and easily accessible service for these problem wastes instead of waiting for the City’s quarterly e-waste and chemical drop-off days to come around. Lord Mayor Clover Moore said the new recycling stations made it easy for Sydney residents to get rid of unwanted and potentially toxic waste. “Batteries, light bulbs and mobile phones don’t belong in our household bins,” the Lord Mayor said. She hoped ‘take-back’ options would be available from manufacturers in the future, allowing residents to return used items for recycling. The batteries, phones and light bulbs are are being collected by ABRI member INFOACTIV. Other members are also involved – MobileMuster runs the product stewardship program for mobile phones, which are processed by TES-AMM. A list of collection points and further information is available here.